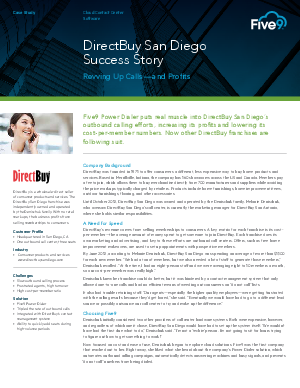 Five9 Power Dialer puts real muscle into DirectBuy San Diego’s outbound calling efforts, increasing its profits and lowering its cost-per-member numbers. Now other DirectBuy franchises are following suit. DirectBuy was founded in 1971 to offer consumers a different, less expensive way to buy home products andservices. Based in Merrillville, Indiana, the company has 160 showrooms across the US and Canada. Members pay a fee to join, which allows them to buy merchandise directly from 700 manufacturers and suppliers while avoiding the price markups typically charged by retailers.